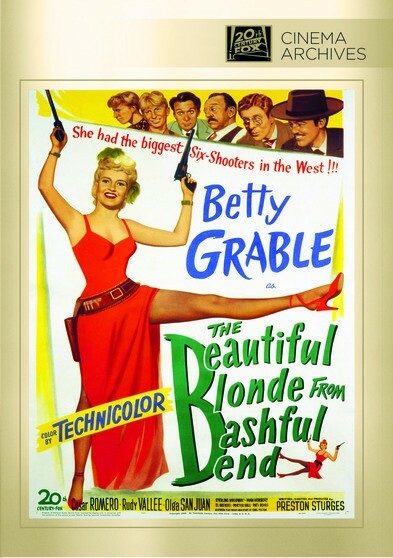 Beautiful Blonde From Bashful Bend – Saloon-bar singer Freddie gets very angry whenever boyfriend Blackie seems to be playing around. She always packs a six-shooter, so this is bad news for anything that happens to be in the way. As this is usually the local judge’s rear-end, Freddie and friend Conchita are soon hiding out teaching school in the middle of nowhere. Temperamental saloon singer Freddie Jones, jealously shoots at her cheating boyfriend Blackie but mistakenly hits Judge Alfalfa J. O’Toole’s honorable behind, forcing her to skip town under the guise of a schoolteacher. Starring: Betty Grable, Cesar Romero, Rudy Valli – 1949 – COLOR – 76 Minutes – DVD, Digitally Remastered.